We believe strongly in developing soccer players to be great individuals both on and off the field. Giving back to local and national organizations is key to creating well rounded athletes. Current and past programs are detailed below. MOUNT KISCO INTERFAITH FOOD PANTRY June 8, 2012 we donated 135 pounds of food from our year end BBQ to the Mount Kisco Interfaith Food Pantry. MKIFP serves over 16o families each week, “we are very grateful for all donations that can supplement our offerings … . The hot dogs and buns really put a smile on our clients faces” Roberta Horowitz, Operations Director. 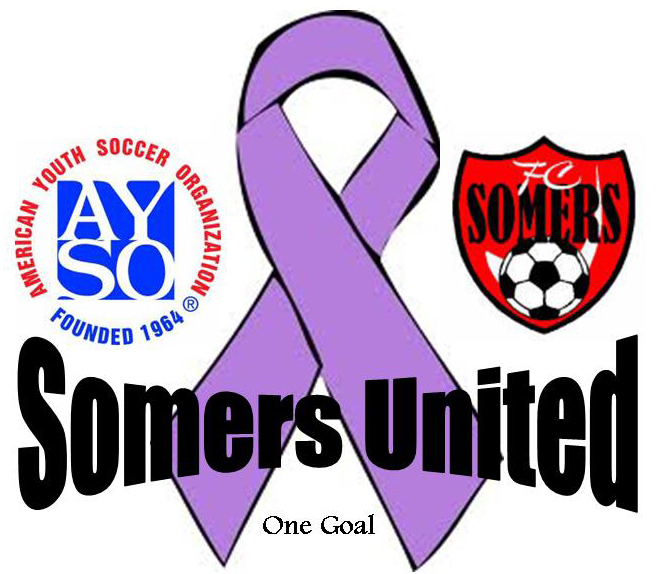 RELAY FOR LIFE 2012 June 1, 2012, FC Somers together with AYSO partnered and participated as Somers United – One Goal, in the 2012 Somers Relay For Live, with captain, Sue McCormack. The total raised by the team was $5,045. Thanks Sue! LET’S PLAY IT FORWARD May 6, 2012, FC Somers partnered with Let’s Play it Forward to collect gently used sports equipment. Collection boxes were on site at Somers High School, Reis Park, and Van Tassel Park. Let’s Play it Forward is a not-for-profit organization, founded by Somers teens, that donates used sports equipment to various causes. It all began when a few life long friends realized that they had an abundance of unused sports equipment in their garages. They started calling several organizations to inquire whether they could make use of this equipment, and the responses were overwhelming. Let’s Play it Forward was founded in February 2012, with a mission to supply used sports equipment to various organizations that are in need. RYDER’S LEMONADE STAND October, 2011, FC Somers families supported Ryder’s Lemonade Stand was established with the help of the Alex’s Lemonade Stand Foundation for Childhood Cancer, and its proprietor Ryder Pelkey, is the 4 year old grandson of Betsy and Bob Stuart of Stuart’s Fruit Farm. In May 2011 Ryder was diagnosed with a rare form of cancer, and this harvest season his family decided to set up the stand to raise money for a cure. RELAY FOR LIFE 2011 June 2, 2011, With thanks to the incredible efforts of Sue McCormack, every walker, baker and donor the FC Somers Relay For Life team contributed $7,975 to the inaugural Somers Relay For Life. Sue, you are the best! jerseys, shorts, shin-guards and cleats, which were donated to Little Feet in honor of Stephanie, and brought to the Millien Dreams Foundation in Haiti. Make a donation to Stephanie’s Mission. The Food Bank for Westchester FC Somers collected boxed cereal for The Food Bank for Westchester which is dedicated to alleviating hunger in Westchester County New York and is the supply and support center for approximately 200 frontline hunger relief member agencies throughout Westchester. Donate to Food Bank for Westchester. This event was a success due to the assistance of many volunteers, specially Amy Brady and her Spirit teammates. FOOD DRIVE September 20 2009, FC Somers families collected boxed cereal for The Food Bank for Westchester which is dedicated to alleviating hunger in Westchester County New York and is the supply and support center for approximately 200 frontline hunger relief member agencies throughout Westchester. Donate to Food Bank for Westchester. Many thanks to each team volunteer and Liz Fedele.